If you’re lucky enough to have an outdoor space at home, getting the best garden furniture set is one way to really make the most of it. We’ll get straight down to business with these patio furniture reviews 2018 so you can get an immediate idea of what options you have at your disposal. There’s nothing worse than scouring through endless listings wondering which will hit the spot and which will hit the mark. We’ve done the hard work for you so you can buy in confidence. Check out these garden furniture sets first then keep reading for a handy buying guide to further assist you in getting the best kit for your garden without a headache. Now, let’s go in detail about each of these products and show you why for many, each of them is the best small outdoor dining table and chair sets in 2018. First up in our patio furniture reviews 2018 is a chic and affordable collection of chairs along with a coffee table from Keter, the Corfu 4-piece. You can opt for this set in a two-tone charcoal or a muted harvest brown. The second colorway comes with cream cushions. The charcoal set commands a slight price premium so make up your own mind on this front. By definition, garden furniture is not something you want to keep dragging in and out of storage. Once you’ve installed it in your yard, you need something you can set and forget. Since this resin won’t rust in the rain or fade rapidly under the sun, you can happily trot indoors after an evening BBQ without worrying about the state of your chairs. Rust not only spoils your furniture but leaves stains all over the patio so the resin is a wonderful touch. We should point out that although the furniture is resistant to fading, you can expect some color loss, especially if you live somewhere with a consistently hot climate. Cleaning is another area where you want a hassle-free experience with garden furniture. Keter delivers this with the Corfu set. Mix up a solution of 1 cup of white vinegar with 6 or 7 quarts of water. Use a hose to blitz any surface debris. Soak a cloth or sponge with your cleaning solution and give the furniture a once-over. For any awkward spots, a toothbrush makes a great weapon. Make sure you dry the table and chairs once you’re through and this will lessen the chance of unsightly water marks spoiling the effect. The set comes with a pair of deep armchairs, a loveseat good for two and a coffee table for all your snacks and drinks so it’s more than sufficient for most gardens. This set is a dream to look after and comfort is also uppermost. The backs of the seats kick back so you can recline as you bask in the sun. The armrests are a generous width too. The armchairs themselves are 2 ½ feet wide and they’ll support up to 300 pounds so they’re perfect for pretty much anyone. Two people can sit upright on the loveseat but you’ll struggle to properly lie down if you prefer to be fully lateral. There’s other garden furniture like a hammock if you favor spending your leisure time flat on your back. Water-resistant cushions slip off easily but you’ll be able to leave them outside and avoid the constant in-and-out which blights some garden furniture sets. That said, you should consider bringing them out of the heavy rain as they are not fully waterproof and they’ll take some drying out after a storm. The corded design means the cushions are a pleasure to sit on rather than feeling like slippery plastic. The open weave lends to first-rate airflow meaning you won’t end up stuck to the back of the chair on a balmy evening. The synthetic material makes sure you won’t be menaced by splinters either. Although this is a solid set, it’s lightweight enough and easy to disassemble so any requirements to pack it up and stash it away won’t present you with a headache. If you are operating on a reasonably tight budget but don’t want cheap, tatty looking garden furniture, this great set from Keter is the ideal solution. With ample seating and a table, you get plenty of bang for your buck in a practically maintenance-free bundle. There’s a 2-year limited warranty so you can buy without a headache knowing Keter has your back. 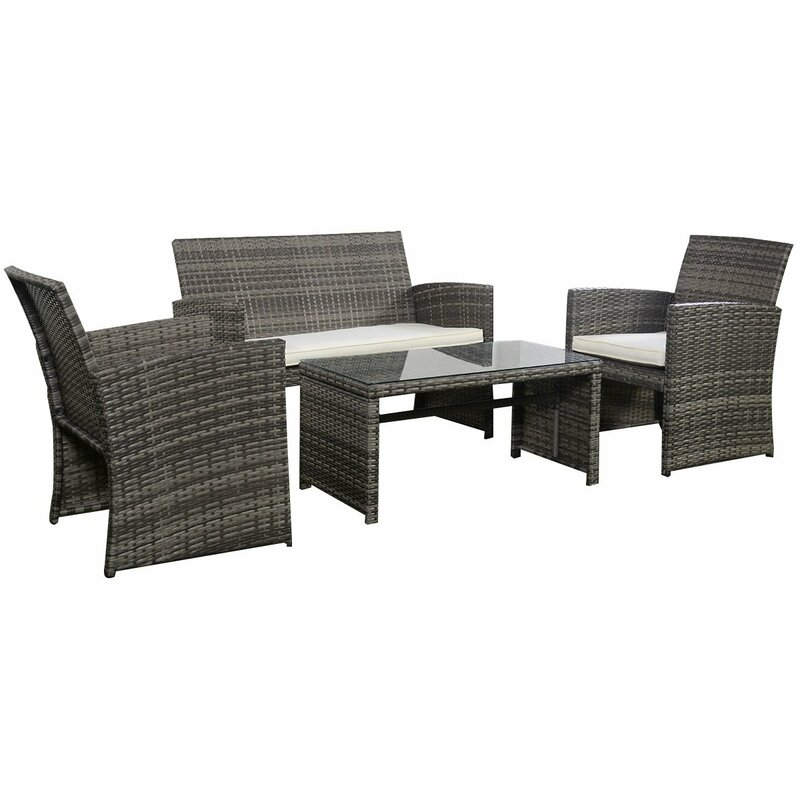 Check out the Keter Corfu 4-piece garden furniture set if you think it would work well in your yard. Next up in ourpatio furniture reviews 2018 is an extremely lightweight and striking 4-piece from Goplus at a price you’ll love. We try to include something for all tastes and budgets here rather than focusing on 5 products that cost the same. Whether you want something for the patio or porch, the yard or poolside, little bits dedicated garden furniture. If you make the mistake of dragging chairs and tables out from inside, they’ll soon end up battered and weather damaged. It’s also a colossal pain to keep on moving things about like that. In common with the majority of competing sets, you’ll get 4 pieces capable of seating the average small family. There’s a single and double sofa with a table so you’ll have more than enough space to relax without the set overpowering the garden. This collection works well in smaller spaces but won’t look out of place in a bigger garden either. Getting things set up is a simple enough job. The tools you need are included in the package and you’ll be up and running in no time. The instructions are crisp and easy to follow. Just use the provided screws to assemble the backs, sides and seats. It’s a smart move to lay things out before you get started so you can get an overall feel. We’d then recommend putting in the screws fairly loosely so you make certain everything’s nicely aligned before driving them home. It’s a relatively bulky package at 80 pounds so factor this in if you need some assistance when your furniture arrives. Once it’s up, each piece is not too heavy so you’ll be able to shift it about simply enough. This is also important when winter comes round… The steel frame means this set is liable to rust out if left for extended spells in harsh conditions. The lightweight nature means you’ll be able to hustle into the garage without straining yourself. Although a few users have moaned about build quality, the steel frame of this set of furniture is actually pretty durable if you don’t batter it around. The rattan used has a weave a bit like wicker but it’s slightly thicker. It’s rugged and yet also stretchy so it will support your body lending to comfort without sacrificing staying power. It won’t splinter up on you and the contrast of the colors sets off any garden perfectly. The cushions are nice and plump with more than adequate padding. In the event of an unexpected downpour, remove the cushions and take them inside. 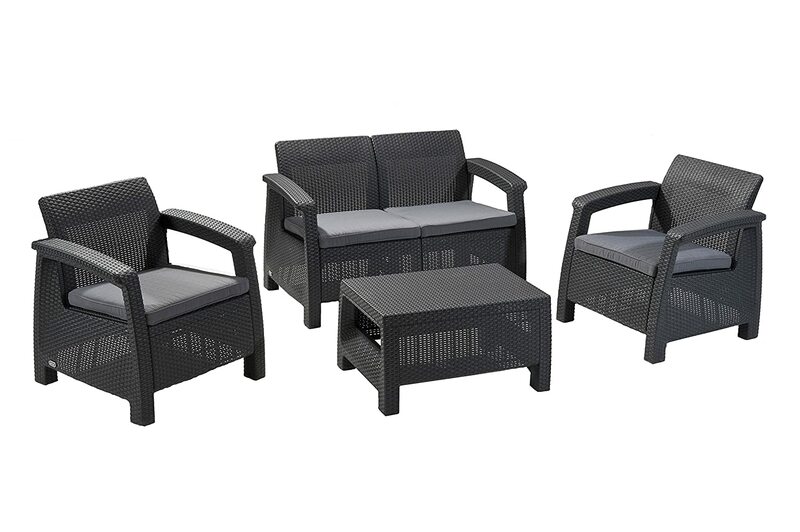 This Goplus 4-piece set is certainly not without its downsides but for a cheap and cheerful solution to garden furniture, it’s well worth popping on your shortlist. With most things in life, you get what you pay for. This furniture set is no exception. If you keep your expectations realistic and understand that the price tag of this set is unlikely to yield furniture that will last for a decade, you’ll be more than rewarded by an attractive and comfy collection of furniture that will last a few seasons if properly cared for. 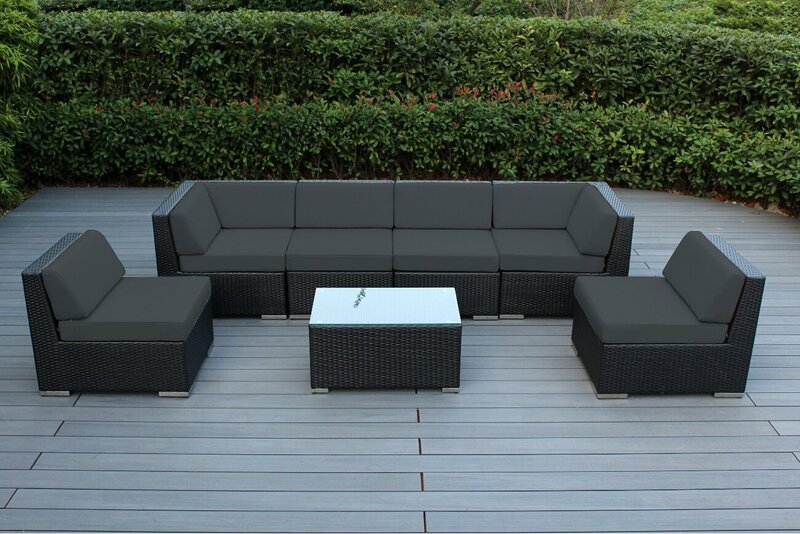 Check out the Goplus 4-piece set for a budget approach to relaxing in the garden. As we reach the midpoint of our patio furniture reviews 2018, a more substantial and pricier offering from H&L. One of the drawbacks of L-shaped sets like this is that they tend to take up a lot of real estate. The beauty of the H&L set is that you can separate the pieces and lay them out as you see fit. If you have a sprawling lawn, you can enjoy the full corner configuration. If, on the other hand, you want to pop the seats and table poolside or in a smaller yard, you can move them with ease. The aluminum frame is strong enough not to buckle up on you after a season or two and it won’t rust out either. The PE rattan wicker is the de rigeur material for garden furniture seats since it marries durability and comfort while still remaining affordable. The cushions are wonderfully padded so you can slouch back and relax the evening away. There are 2 sets of cushion covers so not only can you rock a different color scheme (you’ll get both gray and beige covers), there won’t be any stress when it comes time to wash them either. Just pop on the alternate set while you hand wash the others and you’re good to go. Since by definition a set like this will be placed outside, many people will want to use an umbrella, especially if the climate is consistently scorching. The table comes with a hole so you can set up a sunshade and continue to bask outside in comfort without burning yourself. Cleaning is a matter of wiping down the furniture with some water and vinegar solution as outlined above. In the unlikely event of any problems with your furniture set, customer service is highly responsive and very obliging. Given the bulk of the set, it shouldn’t be surprising that it weighs a considerable amount, 170 pounds to be precise. Make sure you take this into account when delivery day comes around as you certainly won’t be slinging the box over your shoulder and carrying it alone. One minor grumble is that the back pillows often seem to come away. Using some Velcro is a neat way to combat this and ensure they stay in place. 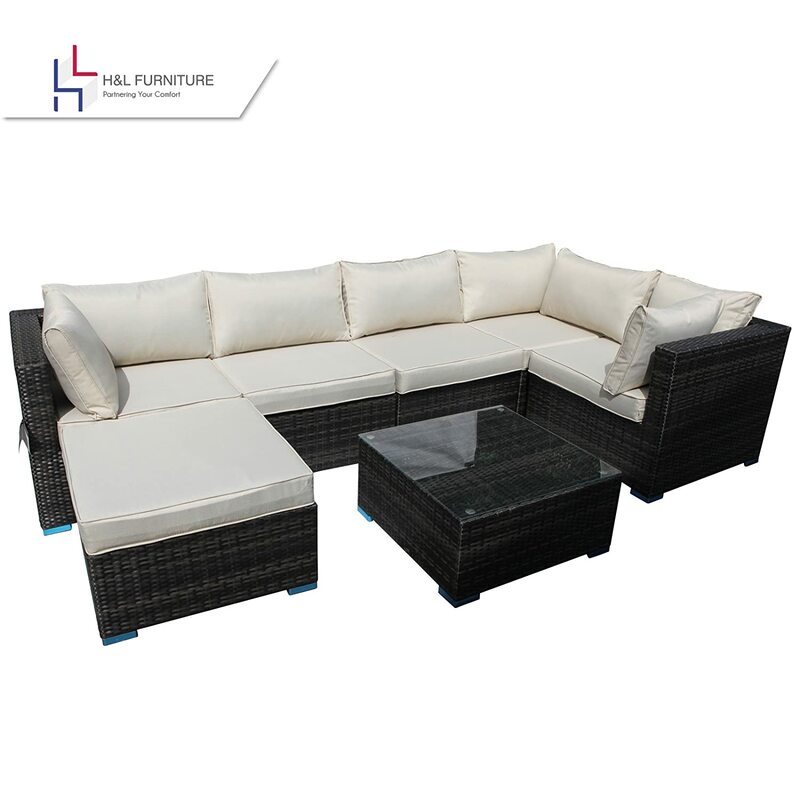 This H&L 7-piece set is certainly not the cheapest garden furniture set at your disposal but it will inject a look of class to your patio, yard or pool. We particularly like the way in which you can rejig the pieces rather than being reliant on one set layout. This is particularly useful if you want a larger set of furniture but you haven’t quite got the space for the long L-shaped set-up. If you’re looking for a winning mixture of durability, aesthetics and low maintenance furniture, check out the H&L 7-piece today. It will grace any garden for years to come. As we near the end of our patio furniture reviews 2018, we’ll explore a versatile sectional sofa and chairs from U-Max. All configurations come with the requisite number of cushions to complete a magnificent set whatever size best fits the bill. Prices range from the extremely affordable with the smaller 3-piece set right through to 4 figures for the complete 14 pieces. We would say that this still represents outstanding value considering what you get for your money in terms of quality and quantity. The key selling point of this garden furniture set is the enormous range of flexibility you’ll enjoy. You can see above the wide scope of pieces you can pick from. Also, each of the pieces comes apart so you can rejig the set according to the design of your garden, patio or pool for a bespoke seating solution. PE rattan wicker is the optimum material for garden furniture. Impervious to damp, long-lasting and comfy into the bargain, it’s no secret the vast majority of sets are crafted from this material. Cleaning is a breeze. Wipe down with an acetic acid solution (vinegar diluted with water) and make sure you dry the chairs off afterwards to circumvent ugly watermarks cropping up. The cushions come away with zippers so everything is close to zero maintenance. Although it’s a very bulky set of furniture, delivery is made in a series of packages so you won’t be left struggling across the garden with a colossal box too large to handle. You’ll need to take care of assembling the pieces but this is not particularly challenging. Unless you have absolutely no practical expertise at all, you’ll be quite capable of undertaking this without calling in assistance. This garden furniture set is not without its downsides and, as always, we’d far sooner draw your attention honestly to any flaws so you can buy with your eyes wide open. There’s nothing worse than buying any product at all after reading a glowing testimonial only to discover undisclosed snags. That said, we still consider these varied sets of furniture make a smart choice if you’re looking for a shorter-term furniture solution that’s easy on the eye and the pocket. For many people, the last thing they want is a jumbo-sized collection of furniture. If you’re in the market for something compact, comfortable and extremely affordable, we recommend popping this garden furniture set on your shortlist. Last in ourpatio furniture reviews 2018 is an upscale offering from Ohana which is not the cheapest option you could roll with but certainly one of the most luxurious. You can pick from a staggering array of 17 different color schemes in pretty much any hue of the rainbow. From black through to stunning turquoise, there really is something for everyone here. 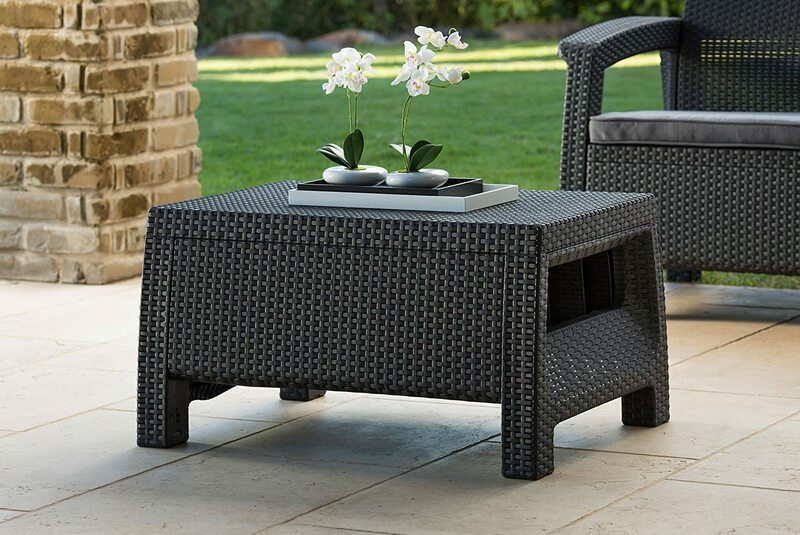 The Ohana collection is a broad spread of accessories and furniture and this 7-piece is designed to integrate seamlessly with that to really set off your outside space. Although the Ohana set isn’t cheap, in return you’ll get a winning combination of stellar build quality alongside nish comfort. While some garden furniture sets have a reasonably short expected lifespan, if you invest in this 7-piece, you won’t be ordering another set for years to come. Too many people focus purely on the bottom line when making any purchase. Consider instead overall value and longevity and suddenly the Ohana set starts appearing like a smart investment rather than a niggling expense. As with most bulkier furniture sets, you’ll enjoy a modular design so you can move the pieces around according to your preference. You’ll get some furniture clips chucked in so that everything stays neatly together. The angled design of the seats with a more than generous 28 inches of height allows to slide back in the sofa without compromising your posture. Made from fade-resistant Sunbrella fabric, these covers are good for over 1500 hours of sunlight before showing any signs of wear and tear. A common flaw with these outdoor seats is that the cushions tend to slip around and come away. Ohana has addressed this by providing Velcro strips so you don’t need to mock up a workaround of your own. It’s this kind of attention to detail that bumps up the price somewhat but we’d argue that it’s money well spent if you get something fit for purpose. Keeping your furniture protected against adverse weather is key if you want it to stay the distance. Luckily, you’ll get a nice cover thrown in free of charge so you won’t incur any additional expense. Choosing a garden furniture set should not be a whim purchase. It pays to think very closely about your intended usage, how many people it needs to accommodate and how much you can afford to spend. If you have a fluid budget and you appreciate quality above all else, we’d strongly recommend the Ohana 7-piece. The build quality trumps that of the other sets we have reviews and you’ll have furniture to last you for many happy summers to come. If you’re looking for a bright and solid addition to your garden, check out the Ohana today and you will not be disappointed. Now you have a sound overview of a selection of 5 of the very best rated outdoor patio furniture sets up for grabs, we’ll move onto our brief but value-packed buying guide. Are you looking to equip a balcony where space is limited? Do you have a large garden where you’d prefer something rather more imposing? Will the furniture sit on a patio or decking? These questions make a smart starting point so you can angle in on suitably sized seating rather than buying on impulse and ending up with something inappropriate. It also pays to factor in the space you’ll need around the furniture so you can move freely and to think about layout in much the same way you would with your furniture in the lounge. The precise placement of your garden furniture set can impact the materials you should choose. If you plan to leave the seating entirely exposed to the elements at the bottom of the garden, you should choose something much more rugged than furniture that benefits from the shelter of a canopy or other overhead covering. The type of ground on which you’ll place your furniture set is also something to ponder. Are you going to pop it on a patio or decking? Perhaps your chairs will go directly on the lawn? Get furniture which is stable enough for your intended surface to avoid wobbling around or toppling over. For chairs and tables destined for direct placement on grass, sidestep soft woods as they will be far more likely to rot away. 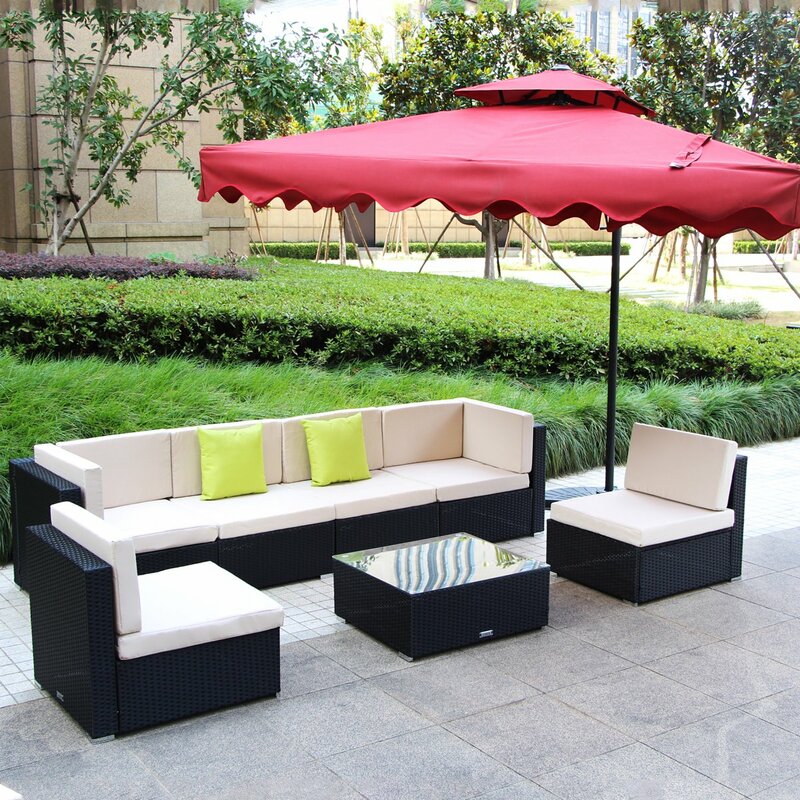 You have a wide variety of choice when it comes to the material of your garden furniture set. There really is no right or wrong when you are weighing up the material of your garden furniture. As with every aspect of your buying decision, double down on your personal needs and get what works best for you rather than angling for a one-size-fits-all solution. It goes unsaid that a critical factor when pondering furniture for the garden is what sort of climate you have in your area. Is the sun hot and relentless? If so, wooden furniture is categorically not the way forward. It’s likely to splinter and crack if it’s exposed to continual direct sunlight. Are there brisk sea breezes battering your garden? With these kind of conditions, you should shoot for heavy furniture rather than something made from plastic or aluminum that’s liable to end up blown around the yard and damaged. How much rain do you get and does this continue throughout the year? Any moisture on an ongoing basis is bad news for wicker furniture so choose accordingly. Let’s be honest, most people want to spend the majority of their time in the garden relaxing. You have enough to do keeping the flora and fauna looking top-notch so the last thing you want is needy furniture. For this reason, the furniture sets we have reviewed above are all as close as you can get to zero maintenance. Aside from wiping them down and washing the cushions, there’s nothing else to eat into your time. Whether you opt for resin or teak, cedar or aluminum, it makes sense to prioritize furniture that won’t have you breaking your back to keep it looking fresh. There’s a vast chasm between decorative garden furniture you’ll barely even sit on and a set you plan to use to hold larger gatherings. Your intended usage will dictate both the size of the set you buy and also the material it’s made from. 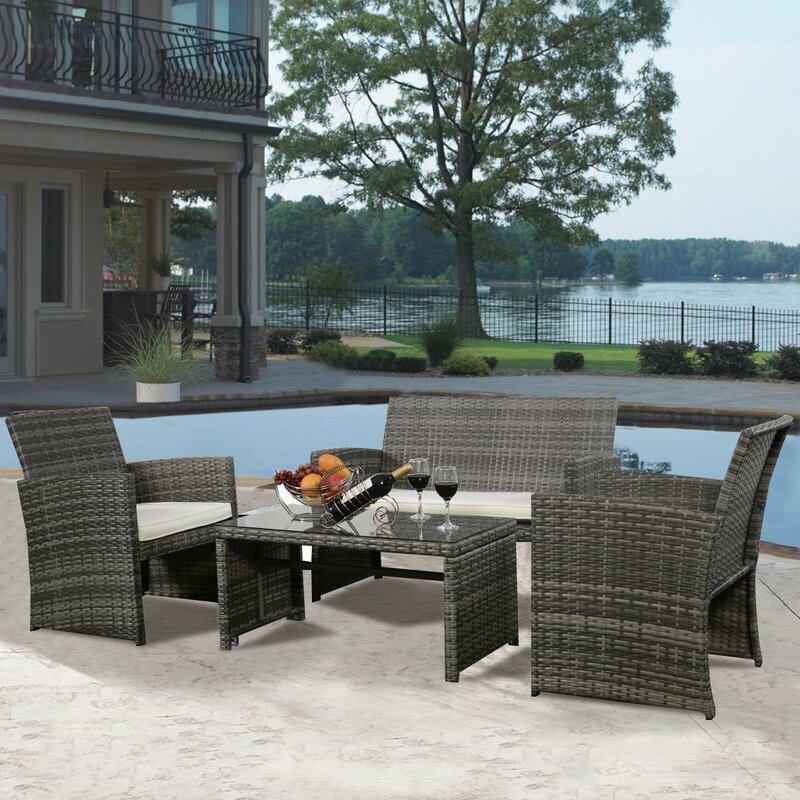 If you’re just seeking to accommodate outdoor family dining, a 4-piece set will be more than sufficient. For garden parties and playing host to friends, it makes sense to opt for a much bigger set of furniture to avoid being cramped or leaving people sat on the floor. You’ll need to work out whether you have the room to store your furniture over the winter unless you live somewhere with a temperate, year-round climate. For most of us, harsh winters are bad news for garden furniture and it’s no use buying a hulking 12-piece set if you can’t find space for it when it needs protecting from the elements. If storage space is at a premium, look for a folding garden furniture set. Although it’s not always practical, it’s wise to check out the sets you have in mind before committing to purchase. Some of you will want to buy your furniture in a physical store in which case trying it out presents no problem at all. How about if you want to buy online, though? Well, without encouraging you to waste the time of salespeople, there’s nothing whatsoever to stop you heading to the garden center or big box outlet to have a general look at what’s available without feeling in any way compelled to buy. Think of it like window shopping from the inside and check out the furniture sets on your shortlist. Aside from the obvious cushions, think whether or not an umbrella is necessary. If so, check out whether the table has a hole to accommodate one or whether you’ll need to invest in a standalone umbrella with a base. Last but by no means least, think about price but do not let this dominate your buying decision. Rather than obsessing purely on the bottom line, consider projected lifespan as well as quality and value for money. Never spend more than you can comfortably afford but don’t be concerned about investing in a high-grade garden furniture set as the enjoyment you’ll get from it will more than repay that investment. We very much hope you’ve found some worthwhile choices in these garden furniture set reviews. We always aim to serve up something for a range of tastes and budgets so there should be a set to suit your needs. Drop us a line any time with your queries or feedback. We’re highly responsive and always love to hear from our readers.